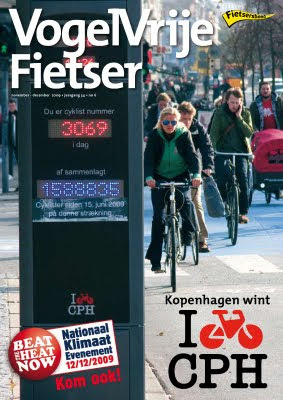 Two members of the Dutch Cyclists' Union - Fietsersbond - visited Copenhagen last month to research a special number of their De Vogelvrije Fietser membership magazine about Copenhagen, The World's Cycling Capital. Now to be honest this is about the same as if a couple of Inuit journalists from Nuuk, Greenland sailed across the Davis Strait to visit the Canadian Inuit city of Iqaluit to write an article about... snow and ice. But hey. They were mostly interested in how we are branding the city on its bicycle culture and how much money and effort is going into encouraging more people to cycle. They interviewed the usual suspects apart from me: Gehl Architects, the Bicycle Office, the Mayor in charge of bikes and roads and what have you. But it was great to meet them, Michiel and Suzanne, since I am a big fan of the Fietsersbond and all their work to promote cycling positively. I had set aside an hour for their interview with me but we ended up hanging out for five hours, which is usually a good sign. The magazine is, as mentioned, a membership magazine but some of the content is accessible on their website as .pdf. Okay, it's in Dutch but Google translate seems to work fine enough if you copy/paste bits of text. Although an English version of this edition is being translated and will be available soon. It was interesting to learn that Michiel, the editor of the magazine, is actually one of the idea men behind the External Airbags on Cars idea that came out of Holland. He got the idea and wrote it up as a kind of "what if..." article in the magazine and it gained a lot of attention and, most importantly, funding. The idea is so far developed now that there will be crash tests carried out shortly. His article was about how to make a car safer for cyclists. He interviewed a lot of researchers and stumbled across all sorts of things, including an airbag for pedestrians make by Autoliv. After the article was published a Fietserbond member, a doctor, called him. He wanted to €8000 of his savings on research into making a car safer for cyclists and then one thing led to another. The Fietsersbond started researching the airbag with the help of a research institute and then things got going. Now the Dutch government is funding the research with €1.3 million. An encouraging story. A simple idea becomes reality. That means there's hope for this idea and this idea. But for now it would be interesting just to understand what their cartoon, above, is trying to say. Culturally and linguistically Dutch and Danish are not that far removed but this cartoon...?! :-). At least Danish cartoons cause excitement.